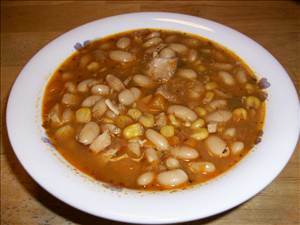 Spicy chili using white beans and chicken. Perfect for warming up on those cool autumn days. Rinse and sort beans into dutch oven and fill halfway with water. Put on medium high heat and bring to boil, cover and let sit for 1 hour. Drain beans and rinse and place in pressure cooker with remaining ingredients, secure lid and set to high pressure for 35 minutes. Cream corn, butter and bacon grease are NOT figure friendly. Low carb and gluten free. There are 208 calories in 1 serving of Pressure Cooker White Chili.